Do we know when Vampires first start appearing? Like when is the earliest record and when is the possible timeframe of first Vampires? I cant find anything saying what for sure caused them so is it up to me why they exist at all? Or did I miss something? Well, they are mentioned to exist during the Neolithic time, so it is safe to assume that vampires were around as long as humanity, more or less- but that's only if you include human vampires. The Strix seem to be as primordial as the darkness which spawns them, and the Mekhet's racial memory reach to the time before humanity even walked the earth, according to their Clan Book, and Danse Macabre suggests the Igigi as pre-human vampires born from the Crone. Vampirisim is not a monolithic thing. Each clan come from a different place and time, and slowly adapted to the modern world to be considered "kindred". Who knows? Maybe even when the lizard-kings ruled the earth, scaled terrors stalked the primordial earth and drank their cold, cold blood. The earliest dated mentions of vampires puts them before the reign of Ramesses II. Meanwhile Strix have been alluded to in the context of the Vinča culture. The Clans either predate the settlement of the Americas (since they existed there before the Europeans stumbled upon them), and/or they pop up spontaneously across the globe which would make it close to impossible to date them. But the exact date of the first vampires can be whenever you choose, before or after any of these mentions. VTR is supposed to be a toolbox so you can use what you think would enhance your game. "Closely-related to those returning to life through bargain or curse are the multitude of creatures that drink the blood or breath of the living to steal their victims’ lives; Greek legends describe Empusae and Lamia, and Greek peasants bar their windows at night against the dreaded owl-like Strix. In Babylon lustful Daevas hunger for blood, while in India, the flesh-eating Pishacha maintain their own shadowy society aside from humanity. Centuries in the future, these disparate monsters will think of themselves as kindred to one another, but in Alexander’s time they are united only by their thirsts. Some are born or manifest with their traits, but others can embrace innocents into their night-time courts. &quot;Closely-related to those returning to life through bargain or curse are the multitude of creatures that drink the blood or breath of the living to steal their victims’ lives; Greek legends describe Empusae and Lamia, and Greek peasants bar their windows at night against the dreaded owl-like Strix. In Babylon lustful Daevas hunger for blood, while in India, the flesh-eating Pishacha maintain their own shadowy society aside from humanity. Centuries in the future, these disparate monsters will think of themselves as kindred to one another, but in Alexander’s time they are united only by their thirsts. Some are born or manifest with their traits, but others can embrace innocents into their night-time courts. They are, if the dead coming back to life thirsting for blood aren’t vampires then I don’t know what is. It’s easy to miss since they go more in detail on Sin Eaters but they are mentioned. The People bury their dead with great ceremony and protective amulets, hoping to fend off the possibility that an unfriendly entity might take the corpse as a body. Villages have been destroyed in the past, survivors telling tales of improperly buried dead hunting their former family and friends for their blood. Though while this does sound like Strix possessions it’s also equally to be some of the first vampires because in all likelihood those two would probably be the same. These aren’t the Kindred no, these ain’t clans. But as long as the Strix were around blood thirsty vampires have been there with them. Ok so it seems like many different types of Vampires or vampire like beings used to exist. And through time they coalest into the modern clans. Vampores could be like anything you want and you could say it was a evolutionary dead end. Or just less defined into specific boxes. Is that right? I kinda like the idea of Vamps being all over the world in various forms as the condition tries to find the perfect combination of traits. Some are using animals as their carriers or twisting them into unnatural creatures unlike anything else. And as humans become more prominant the more humans get infected and turn. In the course of changing hosts the traits of the condition change in order to fit its new hosts. Gaining and losing traits all over the place in order to narrow down the perfect form. I'd personally say that Vampires are as old as humanity. Though the earliest Vampires were probably Revenants; the Clans came to be later. 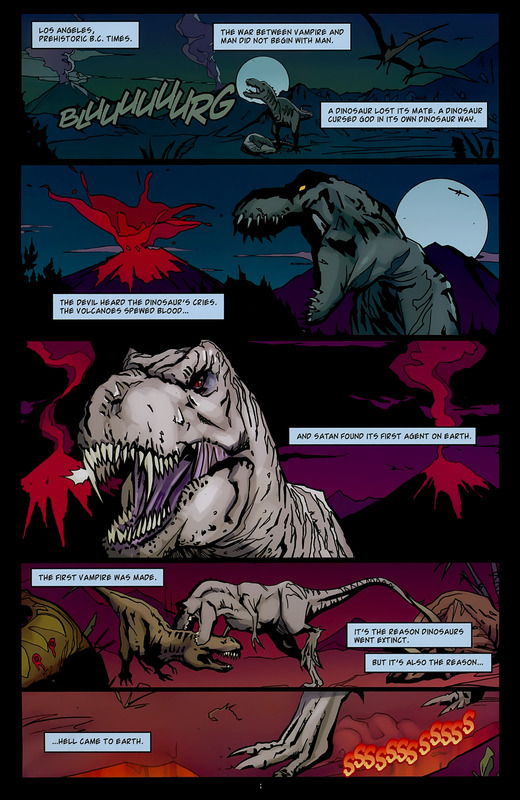 The first vampire was a dinosaur, and a member of Belial's Brood. Actually, Half Damned claims the opposite- yeah, it sounds weird, and it is only a legend in setting, but it is something to consider that perhaps Revenants are not the origin of vampirism, but a true failure at spreading the Curse to others. Well vampires evolve over time and it's pretty well accepted that something akin to convergent evolution is in play. That similar bloodlines awoke in different parts of the world in different times and melted together to form the modern clans. It's these similarities that during history forged them together into Kindred. They are similar enough that they share many traits and are able to learn from each others disciplines. I'd say that to the modern Kindred vampire, the first vampires was probably something akin to revenants, although not as we understand it. More akin to clanless Kindred then modern revenants. The first was probably nothing more then ancient Strix. It's however pretty clear that something alike (some of) the modern clans came around the bronze age, perhaps earlier. In all ease, it's like vultures, you know it when you see one, although the Euro-Africa-Asian ones are completely different from the American ones. Same thing with Kindred. Even ignoring Half-Damned I'd say that revenants would make for a poor start of vampirism considering that they can't Embrace and are thus completely reliant on being created by something else, such as regular Kindred causing spontaneous Embraces. There isn't just one canonical creation myth for vampires in the Chronicles of Darkness. Or if there is one, then it certainly isn't known to us. The 'Mythologies' book gives several optional creation myths for the Requiem vampires, and it's up to you as the storyteller to use those as you see fit. That sounds like they're talking about Strix having corpse. Even because it speaks: "the possibility that an unfriendly entity might take the corpse as a body" in the same paragraph. Even because it does not make much sense to use amulets to try to stop someone from becoming a vampire, now to prevent the body from being possessed by a Strix yes. Last edited by RaphaTheAscended; 11-06-2018, 01:34 PM. Although powerful Strix of the time could try Syntesis, then it is not impossible that there were no-clan Vampires or clans of one/two generation at the time.